I guess one of the challenging tasks of any food photographer is the shoot of ice cream. 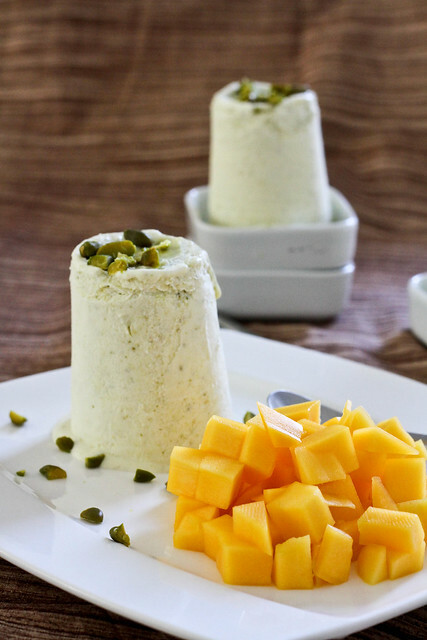 I never imagined that food photography was this tough and complicated until I tried to capture the image of the beautiful Kulfi. It was a bright sunny morning with perfect lighting for the photo shoot. The Kulfi had set beautifully and everything was ready. The first attempt of the shoot was a total disaster.. all that I could capture on my camera was a melting mould of ice cream.. it was so disappointing. With out giving up hope I tried again. I realized that I had to be super quick. Because of the temperature, the Kulfi was melting fast. This time the pictures were a little bit decent. I could have done a better job, I guess I need more practice. I did not make it the original way by evaporating the milk stirring for hours, but cheated a little and used condensed milk instead. But the taste was awesome with a light hint of the rose and crunchy Pistachios in between. I served it with some mango, and the combination was amazing! In a bowl, mix together condensed milk, rose water and pistachio powder. In a separate bowl, whip the cream until it forms soft peaks. Fold the cream into the condensed milk mixture, do not mix vigorously, gently fold to mix everything. Pour this mixture into moulds (I used small disposable plastic glasses), cover with a plastic wrap and freeze for about 5 to 6 hrs or overnight. To Serve, immerse the mould into warm water(not hot) just for 2 sec and tap on the mould from all sides. Serve with mango cubes for added taste or enjoy as it is! 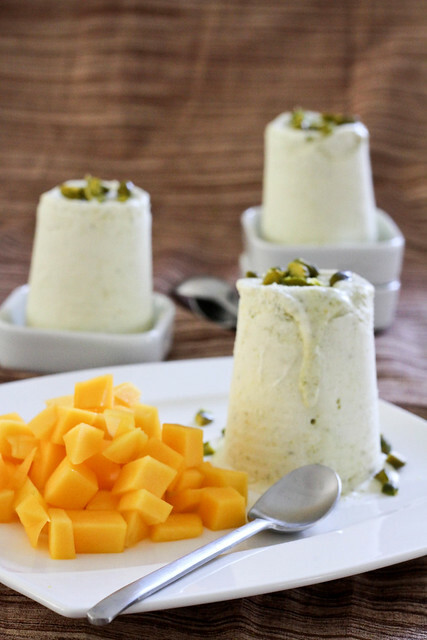 Removing the Kulfi from the moulds may be a little tricky and needs some practice. This is very sweet dish and small portions will be sufficient. Mango is totally optional, you can even use other fruit like strawberries to serve. That is brilliant! I actually like it when it drips just a little bit.. somewhat similar to wjat I see in your last shot. I have recently discovered your blog and I must say you have a nice collection of recipes! I have been awarded the Liebster Blog Award and as per the Rules, I had to pick top 5 blogs. Your blog is one of the top 5. Please visit my blog to collect your award. So sweet of you. Thank you for the award! Wow..Thats sinful delight..Luv the pistochio and rose flavours.. I love this recipe! You are awesome! I’ll try this when I’m back home and i’m sure it will look great on mini triangolo appetizer plate. Thanks for this one. 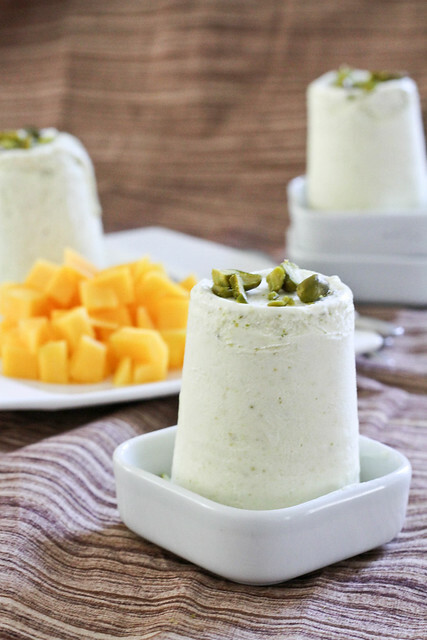 I love this kulfi recipe as it does not require cooking! The photographs are too good! And I like the idea of using plastic cups for freezing! Yummy. They look tempting indeed. I think I have to try them one day. I love how you went back and tried again when the ice cream was melting away. Ice cream is really super hard to photograph. They look tempting indeed. Stunning clicks! can i hav ur recipiesin telugu..
Hi Bharathi, as of now I write only in english. I will keep your request in mind, and may be post recipes in Telugu in future. I tried this recipe and everyone loved it, have already made it twice, nice and easy. Thank you so much for such simple recipe.keep up the good work.love the snaps . I am very happy to hear that you tried my recipe, and your family loved it. Thank you. The picture is very good Spandana. I like the recipe too. I’m definitely trying this for my next get together. 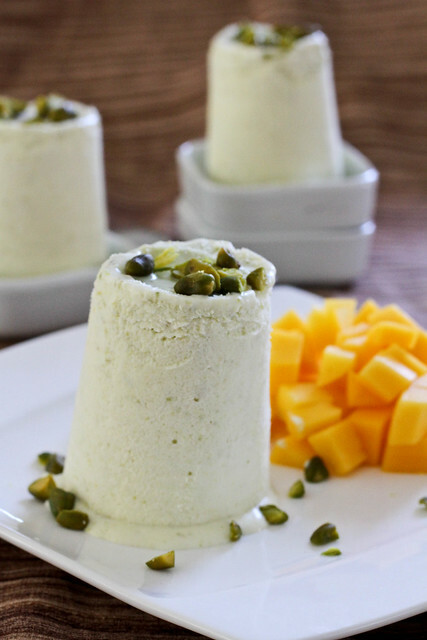 Hi Spandana, the kulfi looks so good. I tried kulfi before by using milk. Even though the results were great it was so time consuming. Your process is so simple and its tempting. I shall definitely try this and let u know the outcome. I also need a small clarification. Can I substitute whipping cream with fresh cream (Nestle fresh cream) as whipping cream is rarely available in my place? Hi Neeraja, you can use nestle fresh cream too.